The 13 products in our third installment of June Staff Picks include a cooperative game from Peaceable Kingdom Press that's a real "hoot," a monkey that helps lull kids to sleep from Cloud B, and the hotly anticipated Rookie Perplexus from Plasmart Inc. Make sure to look below to see the remaining June staff picks. Easily take playtime to bedtime with Mimicking Monkey. Mimicking Monkey’s unique dual track voiceover option allows parents to record personal messages along with each sound to personalize their child’s play, relax or bedtime environment. Familiar voices and soothing sounds can help children achieve a more peaceful, deeper sleep. Caregivers can record a soothing message to their child to help ease separation anxiety. Mimicking Monkey features include: Plays three unique sounds - Monkey fun, angel falls, lullaby; Records voices over all sound options; 30 minute sleep timer; Velcro hands for securing to cribs and strollers; 2 AA batteries included; Illustrated storybook and adoption certificate. — As of 05/27/2011 this product had 3.3 out of 5 stars from 3 reviews on Amazon.com. Pros: Cute; users liked the recording features; on an automatic timer so it doesn't stay on all night. Cons: one user said the monkey excessively shed its fur. Playspaces come in a decorative envelope but become a 3-D play scene. Two sturdy interlocking boards create four areas to populate with pop-out characters with stands. The reclosable envelope measures 9-3/4 x 15" and has a string closure. 100% recycled paper is used for the product greyboard. Playspaces are designed for children ages four and older. They have small parts, and are a choking hazard for children under 3 years of age. This game is easy enough for first time game players and the game can be made infinitely more challenging simply by adding more owl tokens into the game. This allows the game to age with the child or for older kids (or even adults) to play with younger kids. Like in Candyland, kids practice color recognition and moving tokens. Unlike Candyland, Hoot Owl Hoot is a cooperative game, meaning all players are playing for the same outcome together. A cooperative game eliminates stress, builds self-esteem, and teaches kids that playing together can be fun. Kids learn to work together, they share in the game play, and they practice cooperation. The object of the game is move all the owls from start to the nest before the sun rises. Players take turns, but work together. Launch date: May 2011. 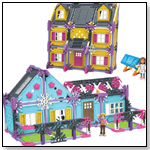 Awards: A Dr. Toy Best Green Product for 2011; 2011 Parents’ Choice Silver Honor Award; 2011 Parents’ Choice Major Fun Award; 2011 Disney FamilyFun magazine Toy of the Year (T.O.Y) Award. — As of 05/23/2011 this product had 4.8 out of 5 stars from 10 reviews on Amazon.com. Pros: Teaches kids to work together; difficulty can be increased as players get better; eco-friendly. Perplexus Rookie by PATCH PRODUCTS INC.
Perplexus Rookie offers newcomers to Perplexus a three-dimensional puzzle challenge, with 75 barriers to success. Users must guide the metal ball through a maze of twists and turns, down dips and around winding spirals toward the maze finish. Players maneuver surprising routes of challenge that test hand-eye coordination, focus and perseverance. 6.5 Inches in Diameter, Perplexus Rookie is a brainteaser puzzle filled with layers of detailed maze structures. A shelter finish keeps the ball in place at the end to secure success. Slick Sand by DUNECRAFT INC.
Other products from DUNECRAFT INC.
Slick Sand will not get wet. Slick sand is saturated with silicon vapors. Silicon is a very slippery substance and these vapors reverse the way Slick Sand interacts with water. When kids pour water on it, the water will stay on top and flow, instead of wetting the sand and sinking down as happens with ordinary play sand. Paired with the fun experiments, the science behind Slick Sand is explained. Kids will be introduced or further versed to terms and concepts like hydrophobe, hydrophile, conservation of mass, the biological composition of sand, and surface tension. Non-toxic. Slick Sand Includes: 1lb each of Red, Yellow, Blue, Green & Purple Slick Sand; Instructions and Information on Slick Sand. These helmets encourage kids to be safe while still expressing their individuality in a fun way. The helmets feature Molded Exotuff™ 3D helmet design; aerodynamic cooling vents, shock absorbing EPS inner shell, and adjustable straps. Have you ever heard a word that triggered you to sing a song? If so, then YOU are Spontuneous™! One player says a word and the race is on for the others to sing a song containing that word. The game Spontuneous™ Challenges players to think of lyrics to songs they know and love. It’s fun, fast paced and full of laughs! This is a set of 8 interlocking Cubes arranged in a 2x2x2 cube shape. The puzzle challenges the player to transform the arrangement of the 8 cubes from one shape to any other shape, without disengaging any of the Cubes from each other. Cubes must be shifted by sliding along their faces. The Cubes can shift in all three dimensions: X, Y and Z, but each face slides in only one direction. 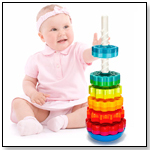 The 8 Cube set introduces the player to this innovative new toy. The ultimate goal is to be able to logically understand how to shift from one shape to another in the fewest number of moves. Other games can be invented by disengaging the Cubes and re-engaging them with the colors "flipped" on one or some of the Cubes, creating a "marked" Cube. The challenge is then to shift the "marked" Cube or Cubes into a specific position in the arrangement. PlasmaBike Red by PLASMART INC.
No batteries, gears, or pedals - just a fun, encouraging and progressive start to bicycle riding. PlasmaBike’s unique design encourages balance, coordination and motor skill development while offering a fun ride. Children as young as 18 months can enjoy the freedom or riding without the added complication of training wheels or anxiety of having to hold their balance too long, too early. Wide wheels ensure that PlasmaBike doesn't tip over in a stopped or stationary position, giving children added confidence and promoting self-esteem. The wide wheels and limited steering range enhance balancing capabilities and provide a smoother transition to a conventional 2 wheel ride. Players become healthy-eating champions as they compete to eat the most nutritious food. Parents and caregivers can playfully reinforce healthy habits, such as exercise and good food choices. Adding and subtracting the points earned or lost throughout the game also helps children with their math skills. This racing themed case displays speeding Hot Wheels cars all over the exterior and a roadway ramp folds out from the interior. Weighing only one pound, this case unzips to lay flat. 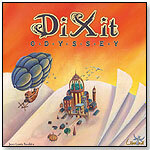 Discover crisscrossing roads, bridges, tunnels, and jumps. Fold the jumps so that cars go veering off course, into each other, and through the winding map. The included Hot Wheels car fits inside perfectly along with hundreds more. Hot Wheels™ and associated trademarks and trade dress are owned by, and used under license from, Mattel, Inc. ©2010 Mattel, Inc. All Rights Reserved. — As of 05/20/2011 this product has 5 out 5 stars from 1 review on Amazon.com. Pros: Makes playing with small cars a lot more portable. Fastrack is an all-new kind of sports game. It consists of a wooden tray with an elastic band across each end and a bridge in the middle with a slot opening. Each side starts with 5 wooden disks. Using the elastic cord, players must be quick and aim well to be the first to send all of the disks zooming across to the other side. The first to successfully clear all 10 disks to the opponent's side wins the round. 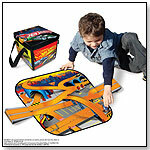 "Fastrack is high quality, eco-friendly, durable and made of wood," Nicole Britton from Blue Orange Games told TDmonthly. Launch date: June 2011. — In a July 2014 survey, one out of 14 retailers told TDmonthly that Fastrack was their store's best-selling toy.